A traveling grand piano. Who would have thought? 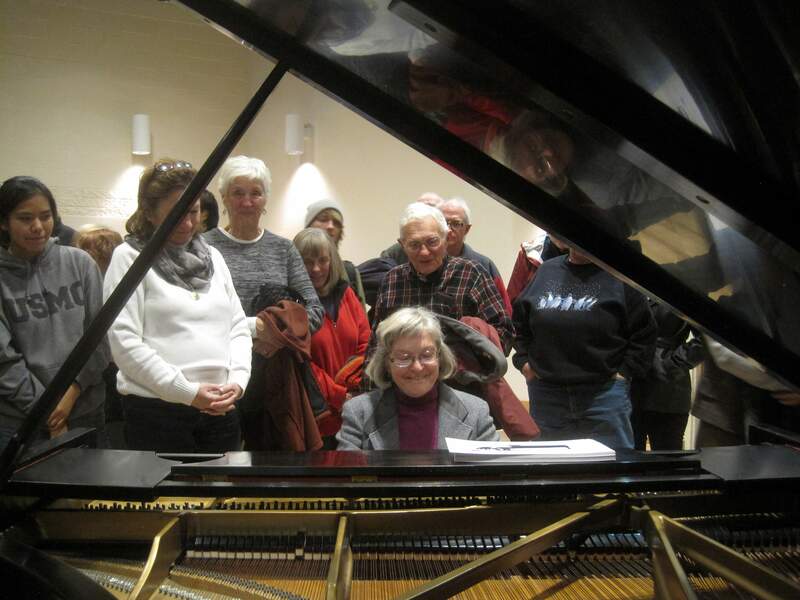 Lillian Wakeley, retired geologist from Dolores, plays Chopin on the Horowitz Piano in Roshong Recital Hall at the conclusion of a lecture by Lisa Campi-Walters of the Fort Lewis College Music Department. A lot of people wanted to see, hear or maybe just touch Vladimir Horowitz’s piano. The nine-foot black Steinway grand, known as CD 503, came to Fort Lewis College as part of an unusual American tour. After Dallas, Houston, Milwaukee, New York, Detroit and a number of other big cities, the piano took an unexpected detour – to Durango. On Nov. 19, a standing-room-only crowd gathered to see it in Roshong Recital Hall. The Horowitz Piano was the focus of the final program in the college’s Life Long Learning Lecture series. Lisa Campi-Walters, associate professor of music at FLC, made the arrangements and prepared a talk about Horowitz’s life, personality and music. Horowitz was born in Russia in 1903 and died in New York City in 1989. Throughout his highly-successful career, he chose to play exclusively on Steinway pianos. In 1934, the company gave him #279503 as a wedding present. The company later replaced it with another, the fabled CD 503, which Horowitz kept in his Manhattan apartment and insisted it travel wherever he concertized. That included tours to Europe and a legendary return to Russia in 1986, not long before his death. In 2014 the Steinway Piano Gallery decided on what may have seemed a crazy venture: a North American tour. Transporting a historic grand piano from city to city for lecture presentations and potential recitals seemed to be a marketing venture that might or might not have paid off. Well, the 2014 tour was so successful the company extended it into 2015, which is when Durango got lucky. “Last fall, Barry Damerell of Schmitt Music in Denver called me,” Campi-Walters said in a recent interview. “He said the piano would be in Colorado during the fall and would I like to have it come to Durango?” She immediately said yes and called Rich Hoehlein of the FLC Professional Associates, the volunteer organization that sponsors Life Long Learning lectures. She asked for a November date and got it. No one knew what to expect on November 19, but a crowd of young and old quickly filled the hall. Campi-Walters introduced Damerell who joked about driving the grand piano over Red Mountain Pass. Then Campi-Walters told the Horowitz story with photos and film clips. When she finished, Campi-Walters let the audience hear the piano’s ring by playing a few random lines, like the opening bars of something Horowitz played in one film clip: Chopin’s “Raindrop” prelude. Then she played Debussy’s “L’isle joyeuse” (The Island of Joy) in its entirety. Some simply touched it, others lined up to sit and play. A few crawled underneath to see the hundreds of signatures printed on the underbelly. When it was her turn, Lillian Wakeley, a retired geologist from Dolores and organist at First Methodist Church in Cortez, settled on the piano bench and took a moment to grasp the situation. She played part of a Bach suite, then, seemingly emboldened, launched into Chopin’s plaintive prelude, the same both Campi-Walters and Horowitz on film had played earlier. The irony wasn’t lost on me, and I wasn’t alone in recognizing the spell the Horowitz Piano cast an unsuspecting audience.